Kun-Yang Lin and Dancers performed at the Prince Theater last weekend, March 22-24, 2018. Faith Project/ The Door revolved around exploring different cultures. Every religion gives a person strength to love life and alleviate our fears. Kun-Yang and a group of research partners arranged meetings where they brought in something to share from their religion, personal experiences, and stories from being part of a spiritual community. 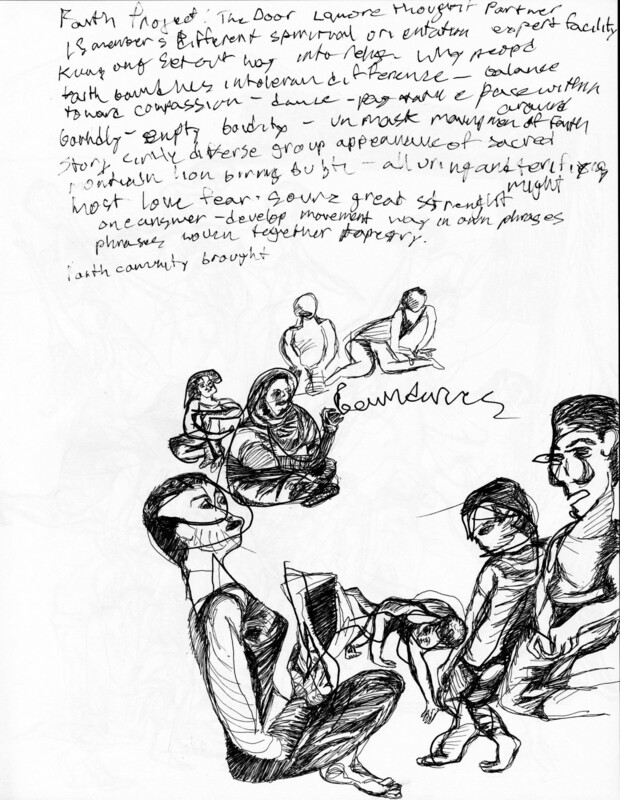 By having a story circle, it gave form to visualize a diverse spiritual environment. Kun-Yang delved into the concept of dance as religion with the help of dance artists, and expert facilitator, Kimerer Lamothe Ph.D, to decipher if religion is a dance and if contemporary dance could be a bridge for transcultural exchange. These story circles translate into movement and body language transverses boundaries. The first dance, Dedication, discusses the feelings involved with the death of Kun-Yang’s father. This was the first time that another dancer other than himself performed this choreography since its creation seventeen years ago. Nikolai Mackenzie performed it on Friday, March 23. A bright spotlight at the back of the stage created a glow around the dancer. He seemed mesmerized by this light and reached up to shade the brightness, but he wanted to keep it in his sight. He walked toward the light, and the warmth of the light caught on the folds of the jogging suit as he turned away from it. This turn by the dancer made the spotlight into an alarming censor which made him want to get away. Dedication was also in the midst of reconciling with the tragedy that occurred on September 9, 2001. The minimal lighting limited the dance to the center of the stage. 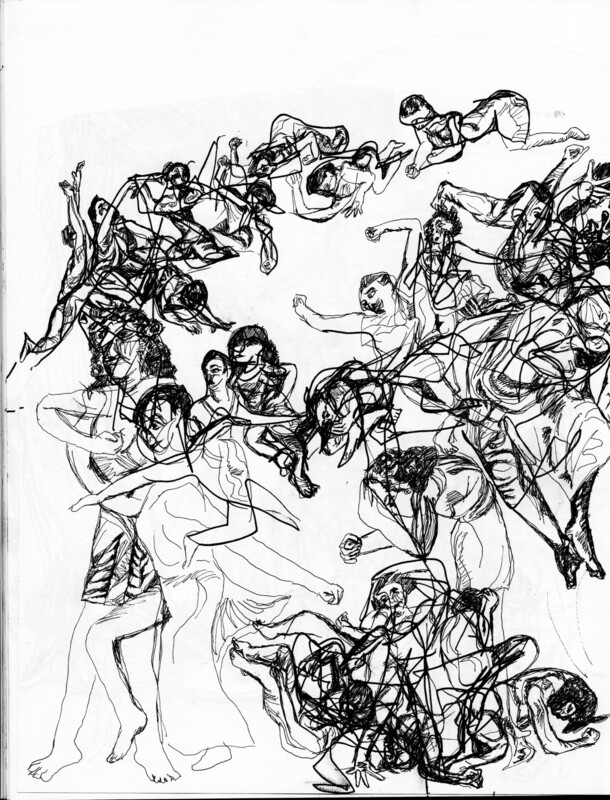 This dynamic yet static gesture complimented the chaos of being in the moment. The darkness of the first piece changes to a lightness created by soft, light fabric hung in layers of different opacities. A scale of white and grey, and a staggering slice of black at the very back of the stage was an ambience of ruin but a new dawn. This is the opening scene to Faith Project/ The Door. 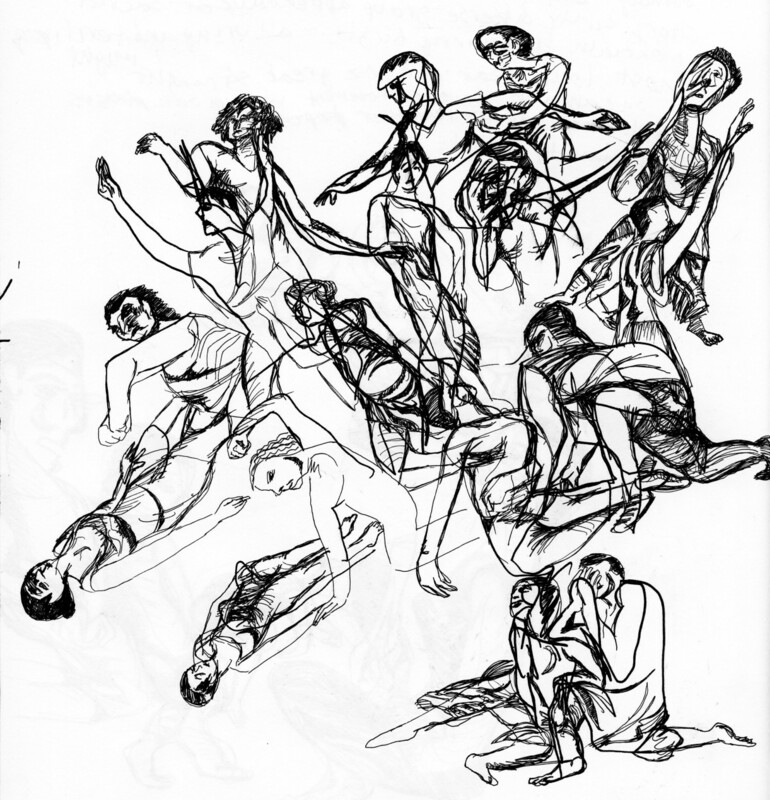 The slow movements of the dancers were uniformly showing stoic faces. They created an atmosphere of a sculpture garden. The expression took on a mythology through cult statues. The statuesque figures in these stories showed a jolting effect, and they broke out of their mold and came to life. The growth and emotion in duets, and the ensemble followed the lead to create a public scene that triggered curiosity in the others. 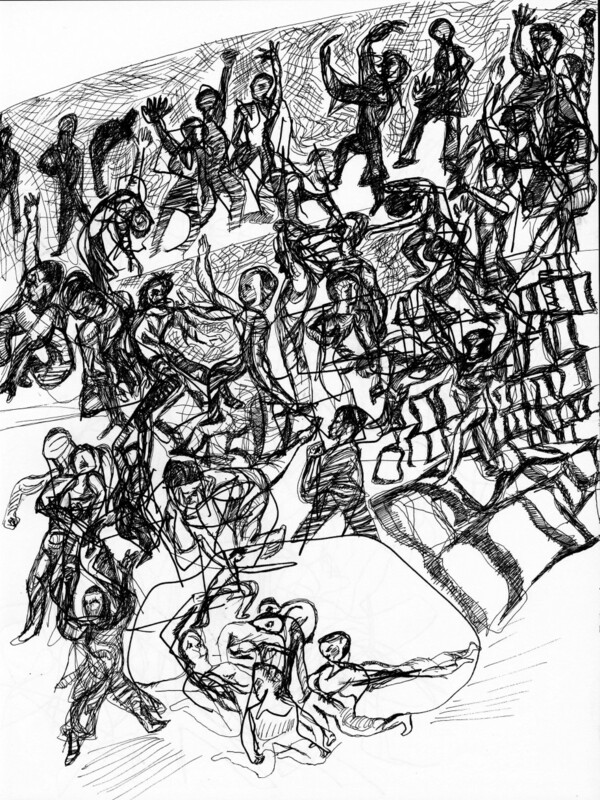 The dance showed instances of violence, heroism, victim, and sacrifice. The collective story circle was a motif that branched out into different scenarios, such as, the ascending cross, the form of Siva’s dancing Nataraja, the many images of Buddha in meditation, and the unveiling of the dance artists from behind a screen made the set design, by Sarah Outing, into a Huppah or wedding canopy. The door symbolizes the boundary before a sacred space. The aerial view of video footage streaming while the dancers spun in stationary positions across the stage enhanced the power of ritual acts. We are ants compared to the totality of the universe and dance in religion raised a human presence to the heavens, nature, or powerful deities. 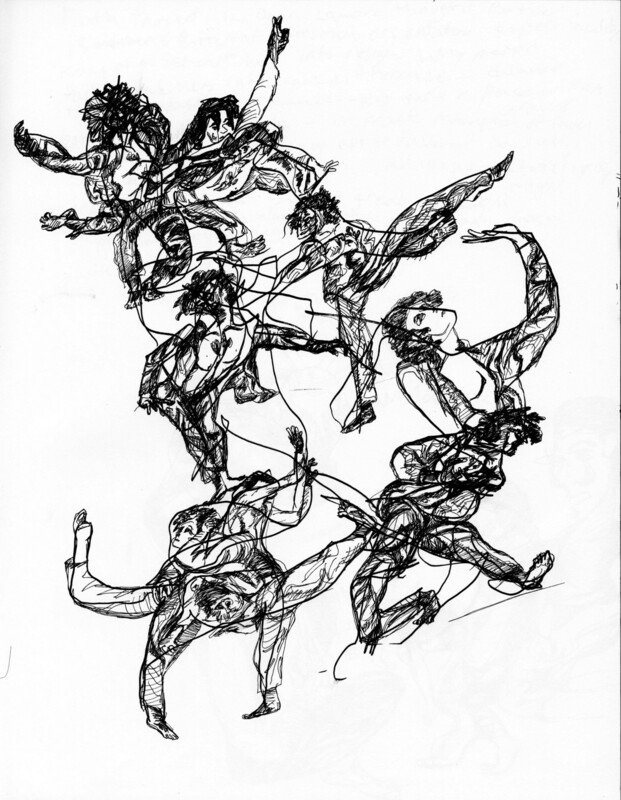 Multimedia design, by Jared Mezzochi, showed a pattern in the choreography that links movement to language on a universal level. KYL/D’s Faith Project/ The Door takes us on a journey across the silk road where religions were part of caravanserai. Religion was strength to travel long distances, and it was a way to create bonds with other merchants. 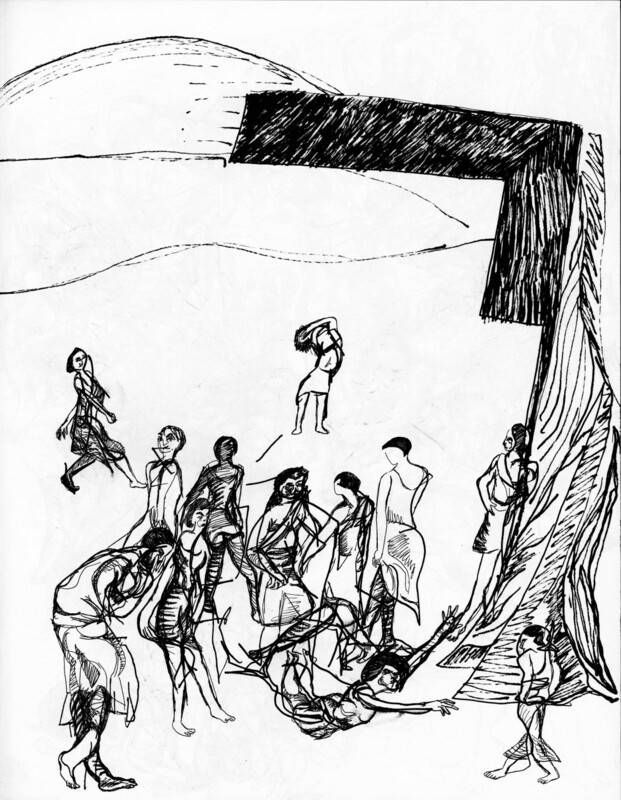 The dancers pounded and stomped on stage, and the stage became the door to the rituals of the ancients and the beginning of globalization among civilizations.